Superman tears through Toyman's army. In the control center he finds that Toyman has become part of his machines, wired permanently to them. Toyman tells him that Brainiac has taken control of all of the nuclear weapons on the planet. Superman tells him that he's going to save the planet. Batman and J'onn have Luthor and Grodd under control. Luthor tells them that he had everything under control. Batman and Atom give a Green Lantern ring to Grodd. Superman arrives to finish up the battle. Brainiac and Black Manta both teleport away, but Scarecrow runs into the sewers. In the sewers Joker attacks Scarecrow, taking him out. Aquaman pursues Black Manta while Superman goes after Brainiac. Cheetah attacks Wonder Woman and Diana takes off her armor to show how far her body has deteriorated. Diana takes Cheetah down, but cannot stop the poison in her body. Superman, Red Tornado, and Zatanna pursue Brainiac, but he continues to teleport away one step ahead of them. J'onn links Luthor's brain to Grodd's and uses him to redirect the missiles. Aquaman finds Black Manta with his son. He manages to destroy the machine Manta is using to control his slaves. Aquaman defeats him and saves his son. Luthor escapes and teleports to Brainiac. Luthor explains that he sabotaged Brainiac's body to draw him to the body on his ship. Superman subdues Luthor and they teleport after Brainiac. They appear in space and find that Brainiac shrunk his ship to avoid detection. Superman quickly freezes the ship and then wraps Zatanna in his cape to save her from the vacuum of space. Hal Jordan heads into space to destroy the missiles as his ring runs out of charge. At that moment, the Green Lantern Corps arrives on the scene, responding to his call and removing all of the missiles. Superman streaks through the atmosphere and performs CPR to save Zatanna's life. On Paradise Island, Diana's mother prays to the gods to restore life to her daughter. Wonder Woman's old body fades into the Earth as the gods give life to a new body of clay, restoring Diana to life. In Arkham, Joker mocks the Riddler as they lead him back to his cell. Batman reflects on the changes they've made to the world, and feels that someday the world really will be made into a better place. In the 30th century, the Legion of Super-Heroes watch through time as Clark Kent heads back into the Daily Planet. Story - 5: Justice has had its ups and downs over the past two years (hard to believe its really been that long), but it really went out on a high note. The characters that deserved the spotlight in the end, Batman, Superman, Luthor, and Brainiac were focused on, and they managed to work in the Legion and the Corps just for fun as well. Luthor once again coming out on top against Brainiac really shows why I love the character. He's always prepared against foes far more powerful than he is, and this illustrated that perfectly. Beyond that, nothing really stood out to me, it was just a very solid issue. My one gripe is that the problem of the villains knowing the heroes' secret identities never gets resolved. But that's pretty minor. All in all, a great ending to the best League story in a long time. Art - 5: More beautiful work from Ross and Braithwaite. The opening three-quarter splash is gorgeous, but even many of the regular panels are great. His Joker, complete with Dracula costume looks incredibly haunting, and the Superman on the previous page is poster-worthy. Superman flying through the atmosphere was also very well done, especially since Ross' style works very well with flames. My favorite scenes though, are the three double splashes. The League standing over Paradise Island with the sun rising is very nice, but the scene with the Green Lantern Corps arriving above Earth is just perfect, and the appearance of the Legion really made this issue for me. I'm really going to miss seeing new work from Ross every other month. 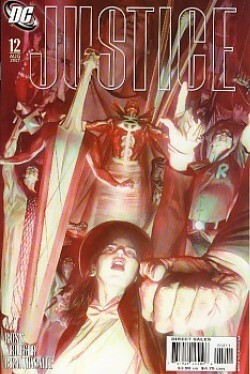 Cover Art - 3: I'm not really liking either of this issue's covers. The hero cover is the better of the two, but I still don't really like a cover entirely focused on the secondary heroes. The color scheme also really hurts it. It's just too washed out. 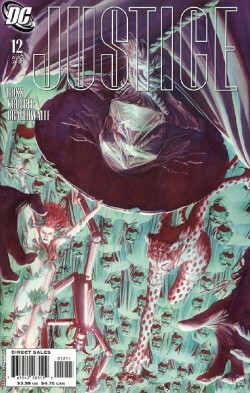 The same holds true for the villains cover, except that a cover with Scarecrow and Cheetah on it is even less appealing. I will give credit to the sea of Brainiac's in the background. It's a very nice effect, and does serve to improve the cover a lot.